Type of wine: Light, very crisp, dry white. Origin: A mutation of Pinot Noir, which it resembles in the field, Pinot Grigio is the Italian white wine most recognized by American wine consumers. It is most prominent in Alto-Adige, Veneto and especially Friuli, where the finest examples are made in the Collio area. 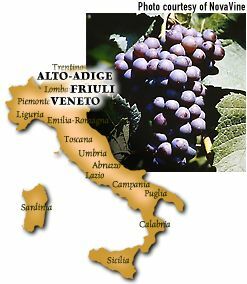 Italians pick the fruit early as it has a tendency to drop acidity when it ripens fully. Description: Pale, straw-yellow or very light copper in color with a bright and flowery fragrance. Firm acidity gives Pinot Grigio a mouth watering appeal. Generally offers nice mid-palate balance with a short, clean finish. Aging: Another one to drink young, young, young! Best location: Warm days and cool nights build acidity and round fruit flavors. FastFoodFacts: A perfect aperitivo/cocktail wine, Pinot Grigio's crispness primes the palate for food. It pairs well with all seafood, whether raw, lightly sauteed, grilled or lightly sauced with cream or butter. Avoid the acid clashes with citrus fruit and tomatoes.